The richness of cherry cabinets brings a sense of warmth to interiors. 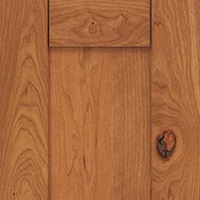 Cherry cabinets have a smooth, close-grained appearance with a fairly uniform texture and random markings. The even grain allows finishes to be applied with ease. The sapwood of cherry cabinets shows mineral streaking, fine pinholes and pitch pockets that lend character to the wood, making it a beautiful choice for kitchens, baths, home offices and many rooms throughout the home. Because cherry cabinets are light sensitive, they darken with age, giving them a lustrous patina. This is a sought-after quality in cherry cabinets, and those who select it look forward to its evolution. For a design full of warmth, MasterBrand also offers Rustic Cherry. 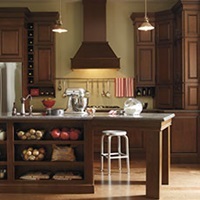 Featuring charming natural attributes of a rustic wood, rustic cherry cabinets include beautiful mineral streaks and pin knots that will not affect the structural integrity of the cabinetry, but instead create a very appealing look.